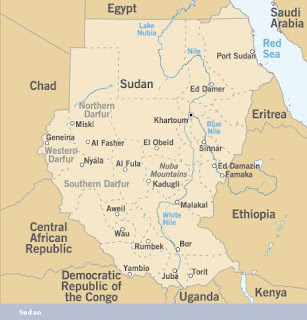 The civil war in the Sudan is routinely characterized as a conflict between Muslims and Christians, Arabs and Africans, or North and South. Religion, ethnicity, and regional issues were the key factors which shaped the two sides in the early days of the conflict, but in the latest bout of fighting which has raged since 1983, the lines are drawn as much along economic lines as ethno- religious ones. Worsening ecological problems in the region, scarcity of resources, and the drought of the 1980s exacerbated the conflict, and has become one of the central issues preventing resolution of it. Sudan, the largest country in Africa, was one of the first countries on the continent to gain its independence from colonial rule in 1956, but has never developed a clear identity of its own. Clear divisions exist between the people of the North, primarily Muslims of Arab descent, and the South, mostly black Africans of Christian or traditional African religions, and it is this division which historically has formed the battle lines in the civil war that has raged off and on since the 1950's. Many factors led to and continue to be important aspects of the conflict, including religious and cultural persecution, poor economic conditions, historical differences between North and South, and misguided social and economic programs. Ecological and environmental factors, however, have exacerbated the problems and, for the time being, make settlement of this war impossible. This country has struggled under the weight of this war for fourteen years, with over a million people killed and 3.5 million refugees displaced. (15) This conflict has many causes and many consequences. Unfortunately, the consequences exacerbate the underlying causes and make settlement even more difficult. The flow of the displaced into the cities continues, though now this flow consists of refugees from the south rather than displaced farmers and nomads. The drought continues and in order to survive, Sudanese farmers continue their harsh treatment of the land and southward progression in search of arable land, a practice that can only make a bad situation much worse. The north-south war formally ended in January 2005 with the signing of the Comprehensive Peace Agreement (CPA) which incorporated the former rebel group, the Sudanese People's Liberation Army/Movement (SPLA/M) into a Government of National Unity (GNU). However the implementation of the CPA has been hampered by the lack of good faith and the absence of political will on the part of the ruling National Congress Party (NCP) and the lack of capacity of the SPLM/A, aggravated by the July 2005 death of its late Chairman, Dr. John Garang, as well as the absence of consistent international pressure. Deliberate obstruction of the CPA implementation by the NCP, particularly the areas of Abyei, oil revenue sharing and the demarcation of the north-south border, are putting the hard-fought peace at risk. In mid-2003, the struggle for land and power in the western region of Darfur intensified, with government-supported Arab Janjaweed militia undertaking a policy of ethnic cleansing towards the civilian population of African tribes. The attacks by the government forces and allied militias led to the deaths of over 200,000 Darfurians and the displacement of over 2 million. Despite the deployment of the African Union Mission in Sudan (AMIS) in 2004, the security situation in Darfur continues to deteriorate as attacks on civilians continue – caused primarily by Khartoum’s unwillingness to rein in the militias it armed- but compounded by fighting between rebel factions and an escalating proxy war between Sudan and Chad, which has also begun to destabilize the Central African Republican (CAR). After seven rounds of peace talks, a peace agreement was signed by the government and one faction of the Sudanese Liberation Army/Movement (SLA/M) in May of 2006 but the weakness of the agreement and the lack of support for it on the ground in Darfur do not bode well for its ability to secure peace for the people of Darfur. In the second half of 2006 attacks on civilians and NGO workers increased dramatically and security dropped to its lowest level since the beginning of the conflict. Despite faltering international pressure, Khartoum continues to resist the presence of a UN peacekeeping force to support the beleaguered AU troops. In eastern Sudan, a peace agreement (the Eastern Sudan Peace Agreement – ESPA) between the Government of Sudan and the Eastern Front rebel group was signed in Asmara in October 2006. However, as with the DPA there is lack of support for the agreement, which is seen by many as another attempt by the Government to silence its opponents by buying them off and making empty gestures. Crisis Group’s Nairobi-based team reports and recommends policy on the situation in Sudan.